Big and small. Every kind of fabrication. Plain and fancy. We all love tote bags! Tote Bag Made by Debbie Duckworth. What about a simple-to-make tote bag that can be embellished with fabric or wool, embroidered or quilted, embellished with buttons, ribbons and fancy bits? It’s a bag that is completely original and just your style! If that sounds like your kind of tote bag, then the Wooly Felted Tote Bag Challenge is for you! Tote Bag Made by Doug Leko. We’re partnering with Thea Jerak of Wooly Felted Wonders for a Tote Bag Challenge. All you need to do is get one of the Tote Bag Kits – see below – and decorate it! Tote Bag Made by Erin Moore. 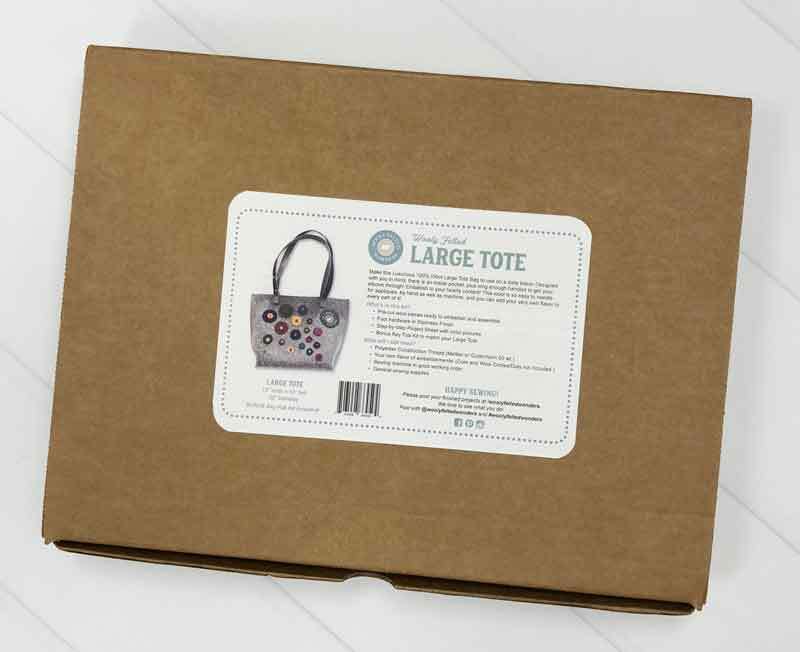 What does the Wooly Felted Wonder Large Tote kit look like? 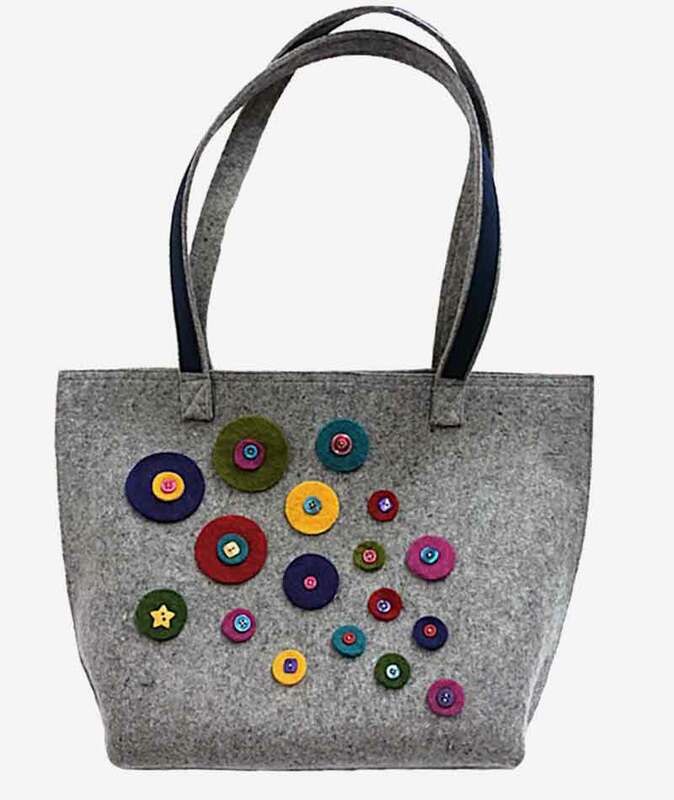 This is it – the Wooly Felted Large Tote kit. That’s Thea’s original bag on the label. The label includes what’s in the box and the additional notions/tools needed to make the tote bag. Each piece in the kit is labeled for ease of construction. 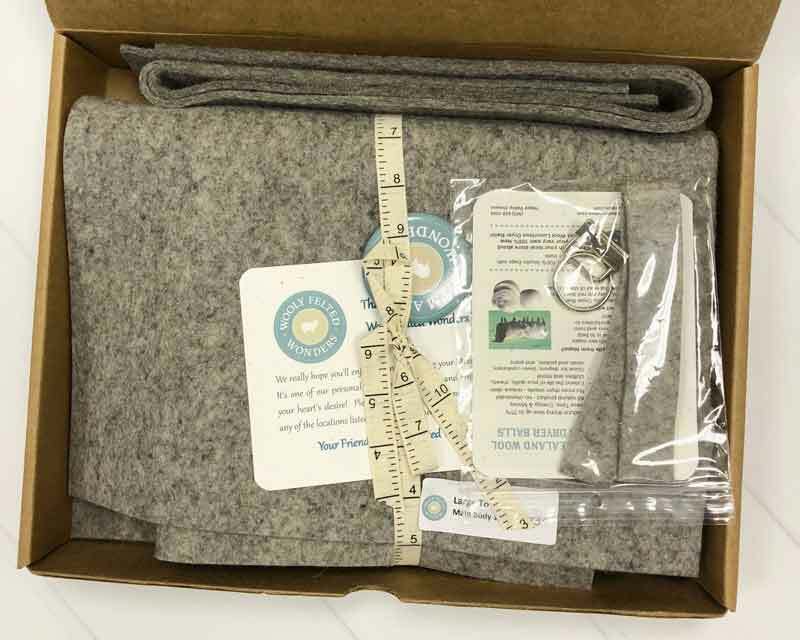 Tell me about the wool… It’s 100% felted wool that is a very generous 1/8″ thick. When assembled, some layers will be a generous 1/4″ thick. The wool is sturdy and durable, and will last for many years with regular usage. Tote Bag Made by Tammy Vonderschmitt. Sewing thread – Thea uses a 50 wt. polyester thread but we’ve been using 40 wt. cotton threads with great results. Embellishments – of every kind! Sewing machine in good working order – a regular, home sewing machine will do the job. Wonder Clips or other binding-type clips for holding pieces together during assembly. 90/14 sewing needles for assembly – while the felted wool stitches easily, it is quite thick. Steam-A-Seam Lite or Lazy Girl Fusi-Bond Lite – for fusing fabric or wool to the base tote bag for embellishing. Cotton, polyester and rayon threads in 35 wt., 28 wt. or 12 wt. for decorative stitching – including top-stitching and assembly. Where do I get a kit? At your favorite quilt shop! If they don’t have it, ask them if they’ll order one for you. How do I enter the Challenge? The Contest Instructions and Prize List is available here – Moda Wooly Challenge – and the Official Entry Form will be on this page when the Challenge officially begins on October 15, 2018 – Monday! Tote Bag Made by Dawn Cornell. 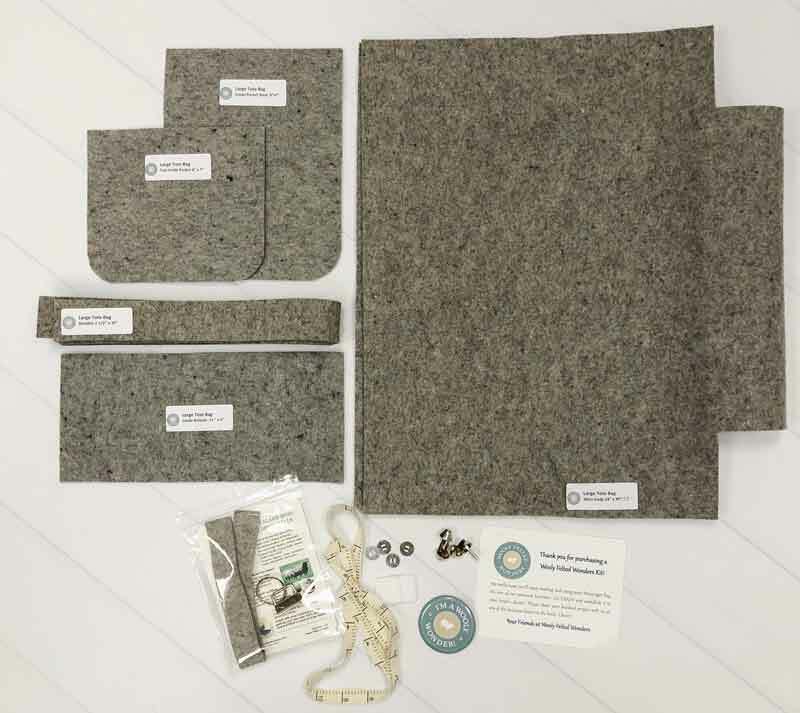 When it comes to creating your bag – the only requirement is that you start with the Wooly Felted Wonder Tote Bag Kit, and that you use all the parts. While the Official Rules state that the bag be made to exact pattern specifications… there are a few allowable exceptions. For example, putting the side and box-corner seams on the inside instead of on the outside is an acceptable variation. She also fused fabric to the inside, making the bag a little bit less soft-sided. The inside of Debbie Duckworth’s bag. So get busy thinking about what kind of embellishment you’d like to add! You’ve got until January 15th! By Carrie NelsonIn NotionsTagged challenge, Tote Bag, Wooly Felted Wonder, wooly wonder8 Comments on Wooly Felted Tote Bag Challenge! Previous Previous post: Day of the Girl: Meet Harriet! What is the price of the kit? I clicked on the link to go to the Webb site n the price is not n the description. I saw a flier stating it was around $75. They are for a pre-order, but a good price. They only have 8 left. Thanks for the scoop! I just ordered mine. Hi. I filled out the entry form thinking I would downloading a printed form to fill out. I do not have a completed ready! Should I fill out the form again when my bag is finished? Thank you.